One of my goals for this blog is to help others achieve clarity within their own lives. Creating a bucket list is one way to clarify some goals within your life. I would set an hour aside for this project, so you can think it through and put together a list with meaning. Creating a bucket list will give you a clear set of life goals to work towards and help you feel a sense of meaning within your life. This is not an average to do list. If you are considering a bucket list you probably have a to do list already. To do list’s are great for tasks and things that need to get done. 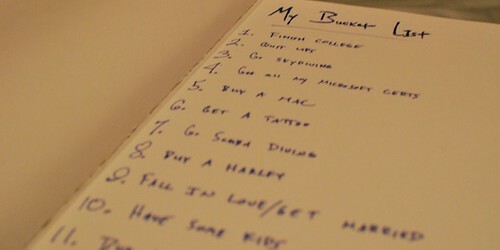 A bucket list is items you want to accomplish before you kick the bucket (hence the term bucket list). What do you want to accomplish before you kick the bucket? What are the things you have always wanted to do but never have? If you have an unlimited amount of money, resources and time what would you do? Are there any special events you want to be a part of? Hopefully this gives you an idea of a brainstorming list. Remember… not to limit this list… just write what comes into your mind. I recommend having at least a 100 items on your brainstorming list. Be inspired by others. Use other Bucket Lists for some ideas. Check out my bucket list for some inspiration. Use categories. Break down your list into categories. You might want to have a list of categories like this… Adventure, Crazy Stuff, Home Improvement, Health & Fitness, Creative…etc. Document everything! Write your list down or better yet put it on a blog. Journal about each time you cross something off your list. Take pictures and video. This is the first post in a series titled: How to Live a Life of Clarity.